Bayer was one of only two supervisors awarded from throughout the entire university. Texas A&M University President Michael K. Young has announced the recipients of the 2018 President’s Meritorious Service Awards. This year, 25 individual staff members, two supervisors and two teams were recognized for their service to Texas A&M. 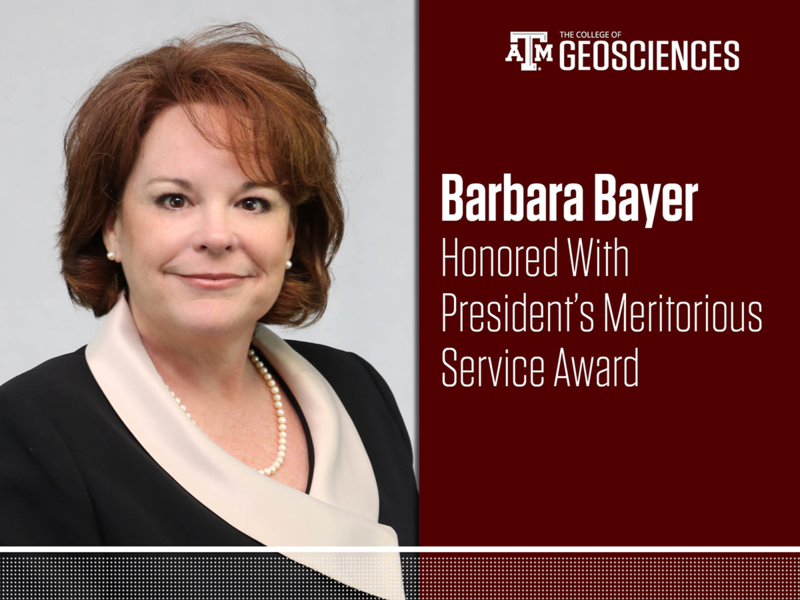 Barbara Bayer, assistant dean for finance and administration in the College of Geosciences, was honored with a Supervisor Award. These prestigious awards recognize and rewards staff who have demonstrated their commitment to the Aggie core values of excellence, integrity, leadership, loyalty, respect and selfless service. All university employees, as well as Chartwells and SSC Services for Education employees, are invited to the award ceremony honoring these outstanding staff members. The ceremony will be held on April 23 at 3:30 p.m. in the MSC Bethancourt Ballroom. A reception with refreshments will follow the ceremony and serve as the official kick-off for Staff Appreciation Week at Texas A&M. Read the full list of recipients.